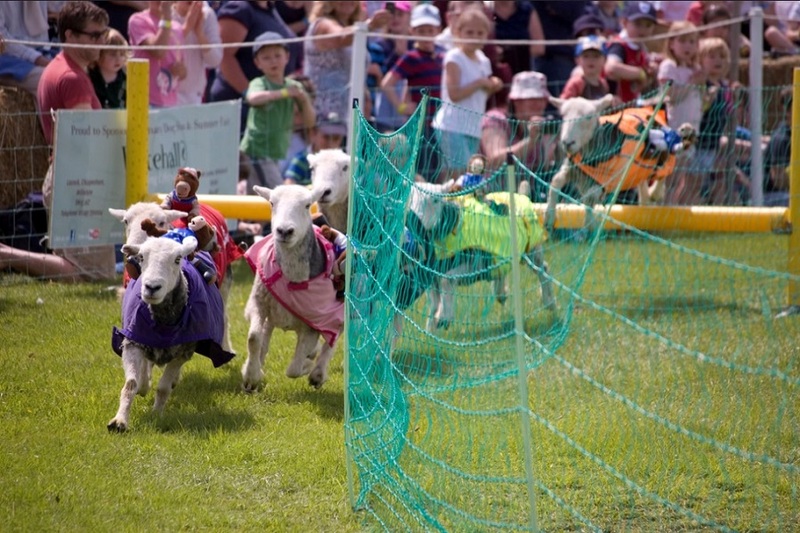 Activity trackers could allow farmers to breed high performance sheep … but probably not for racing. Image: Fraser Reid (Flickr, CC BY 2.0). Erase that image of headband wearing, treadmill running sheep from your mind (sorry). But in the same way that wearable devices such as Fitbits log your activity and health, activity trackers could soon be a vital tool for Australian farmers to monitor the health and behaviour of their sheep. Consider for a moment that a ewe (female sheep) can change paddocks 10 times a year, and the feed in each paddock might be completely different (grass, shrubs, harvested crops). Simultaneously, the ewe will be carrying, suckling or teaching its lamb what to eat. With approximately 74 million sheep in Australia – and more than a billion worldwide, managing the welfare of their flocks is a big logistical problem for farmers. Our researchers are looking to solve this problem by developing customised activity trackers for sheep using GPS and accelerometers that measure 3D movement. 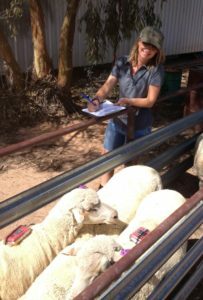 Woolly weigh-in: our ovine friends are readied before being put through their paces (with Tanya Kilminster, DAFWA). Sheep fitted with the trackers attached behind their shoulders were grazed in field trials in Western Australia to test their effectiveness, with the help of local farmers*. Our senior research scientist Dr Dean Thomas said farmers are starting to use devices like water point monitors, GPS and drones in their businesses. However, the trials showed that the trackers could inform broader practical management decisions by monitoring animal growth and health; escapes, predation and theft; water supply; erosion, and pasture quantity and its use. “Farmers generally rely on gut feel, rules of thumb and visual observations to manage their livestock,” Dr Thomas said. The team’s next challenge is interpreting the captured data to maximise its value. But to do that, they’ll go back to basics and visually monitor sheep behaviour and productivity across a range of situations. For instance, can sheep behaviour be used to alert a farmer when the current paddock has run out of feed? Can the speed of a flock’s movement be used to detect a predator so an alert can be sent to a farmer? Another challenge is waiting for hardware costs to drop further before farmers invest in equipping their flocks, and the more sheep fitted with the trackers, the broader the opportunities. Just imagine if every sheep had their own tracker – stray, sick, or injured individuals could be quickly identified and helped. Dr Thomas also said sheep breeders would benefit from large numbers of individual sheep being monitored, by picking up desirable phenomic – or trait – information. Advances in livestock management technologies may provide a solution to many of the challenges associated with keeping sheep in mixed crop and livestock farms, and hold the key to helping farmers breed and manage healthier and more productive sheep. Find out more about our research into precision livestock management here. *Special thanks to Facey, MADFIG, West Midlands, West Arthur Trials Group, UWA Ridgefield Farm, and the Grower Group Alliance for assisting with this research. Sounds like a great project. We are having trouble with wild dogs. Can I suggest another project for coming up with devices to keep sheep and calves safe? Hi Cheryl. I agree this technology has good potential as part of an alert system for wild dog activity. Thanks for the encouragement to pursue this line of work. My folks have a merino stud near the town of Canowindra, NSW. They might be interested in trialling your product and offering some feedback? I can see this being useful in livestock health and stress monitoring, especially in extremes of temperature0exposure thus leading to improvements in shelter, wind protection etc, is there diagnostics such as heart rate? Anyway let me know and I can put you in touch with them if you like. Thanks for the suggestion Adrian. We are continuing to look for opportunities to continue trialling and improving our analytic techniques, and also work toward making the technology commercially feasible. If a chance comes up I’d definitely be keen to work with this on your family farm. Please keep in touch. There is also a lot of observable information based on what/when/where the sheep eats. The book, “The art and science of shepherding” edited by Meuret and Provenza is an excellent text on guidelines of shepherded sheep behaviour in France. Left to its own devices, a sheep tends to eat all the favourite plants first, then move on, leaving the less favoured plants for other species to eat. But humans have other ideas to preserve pasture quality a bit longer and so move the sheep on. The addition of a fitbit is interesting, especially coupled with GPS tracking. We use cameras and remote monitoring on alpacas, leading to interesting observations too. Thanks for your feedback Jill. I agree that the book “The art and science of shepherding” is excellent work, and have been lucky enough to attend presentations by these guru’s. One of the interesting things with the GPS results was to observe the change in their behaviour after rain, and subsequent pasture germination – a large increase in their daily travel. All the best with the alpaca work.